Todays picture of the day is of a Starboard Lateral Buoy was taken on a stunning outbound pilotage from Glasgow whilst onboard the RRS James Clark Ross, we had been in to have our stern gantry re-installed. The weather was spectacular, I believe I have the time-lapse video for the pilotage, I shall see if I can upload it when I have better internet. 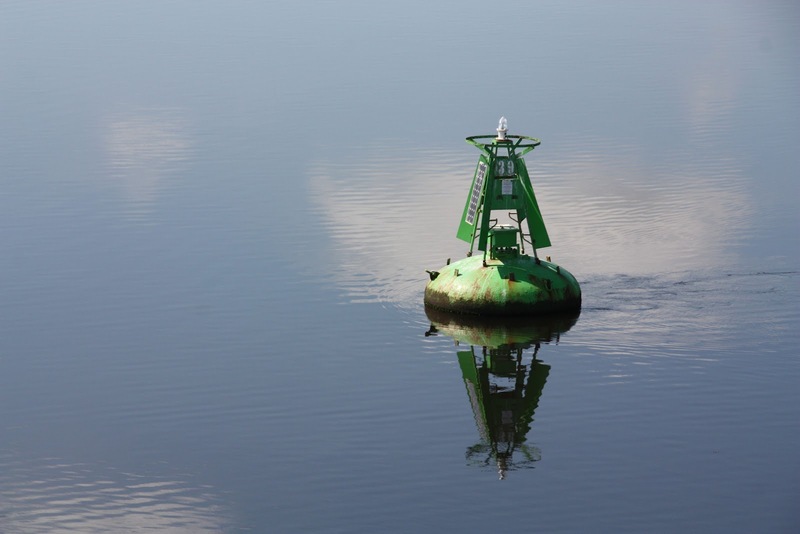 A Starboard Lateral Mark or in this case buoy is used in maritime pilotage to indicate the edge of a channel. Each mark indicates the edge of the safe water channel in terms of port (left-hand) or starboard (right-hand). These directions are relative to the direction of buoyage; in a river, the direction of buoyage is towards the river’s source; in a harbour, the direction of buoyage is into the harbour from the sea. Where there may be doubt, it will be labelled on the appropriate chart and nowadays ECDIS computerised charts. This entry was posted on Thursday, October 4th, 2012 at 12:42 pm by The Mariner. You can follow any responses to this entry through the RSS 2.0 feed.